The brand with the four rings is showing the Audi A3 e-tron Concept at the 2013 Geneva Motor Show in March. This Audi A3 e-tron is a hybrid A3 in which Audi has been working intently to electrify the drivetrain using plug-in hybrid technology. 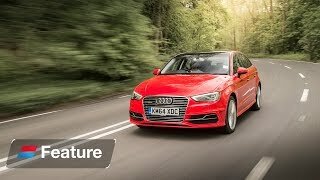 The Audi A3 e-tron can be driven with just the combustion engine, just the electric drive or in hybrid mode. Power for the A3 e-tron comes from a 1.4 litre direct injection petrol engine good for 148bhp working with an electric motor good for an extra 101bhp. Maximum combined output equates up to 201bhp and 258lb/ft of torque, enough for the A3 e-tron to sprint from 0 to 100 km/h (62.14 mph) in 7.6 seconds on its way to a top speed of 222 km/h (137.94 mph).